Kochi, Nov 28 - Bhuvaneshwari, wife of 'tainted' Indian speedster S. Sreesanth, has written on her twitter handle that "injustice anywhere is a threat to justice everywhere." Bhuvaneshwari wrote: "I am writing this with a very heavy heart as it breaks me to pieces to see Sree thinking or talking about worst days of his life. I wish and pray no one ever goes through what he and his family went through". Despite being cleared by a Delhi court in the match-fixing allegations against him, the life ban imposed on him by the Board of Control for Cricket in India (BCCI) continues. "Cricket is a game where you have an age limit and hence justice delayed is justice denied...Despite getting a clean chit from the court, BCCI is still holding the matter," wrote Bhuvaneshwari. "Injustice anywhere is threat to justice everywhere." "Why is he being punished for something he never did and has been proven innocent? Besides, if they are talking about zero tolerance for corruption, why are they not taking the names of those 13 players whose names are sealed in an envelope after the findings of the Mudgal committee, which was appointed by a court? Why is there a double standard? Why is it only Sree, who is still fighting the matter, in spite of being proven innocent," asks his wife. "I hope BCCI allows him to re-live his life... which is cricket. I really hope that you all will stand and support him for his fight for justice," she said. In a match-fixing case, Sreesanth had to cool his heels in Delhi's Tihar jail in 2013. In 2015, the now 34-year-old pacer along with two other players was exonerated by the Delhi court in the case registered by the Delhi Police which invoked the Maharashtra Control of Organised Crime Act (MCOCA). On account of the life ban, the pacer cannot play even league cricket nor get access even for practice to any of the cricket grounds where the BCCI or the state cricket associations have a stake. 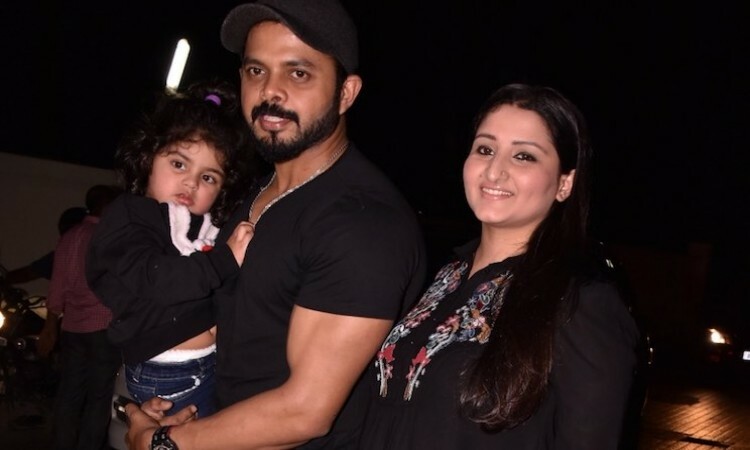 The BCCI Disciplinary Committee headed by present Union Finance Minister Arun Jaitley had slapped a life ban on Sreesanth. Sreesanth is the second Keralite to represent the country. In his brief career, he has played 27 Tests taking 87 wickets, and picked up 75 scalps from 53 One-day Internationals seven wickets from 10 Twenty20 Internationals.